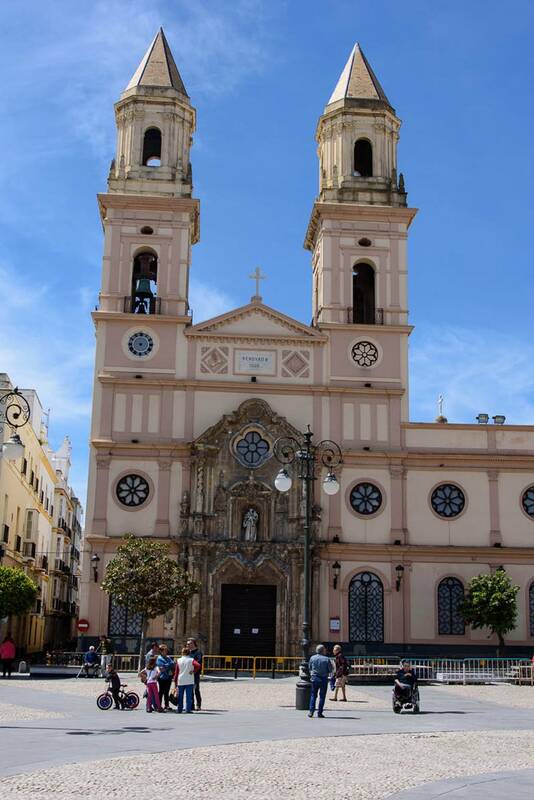 Cadiz is a city and port in southwestern Spain. 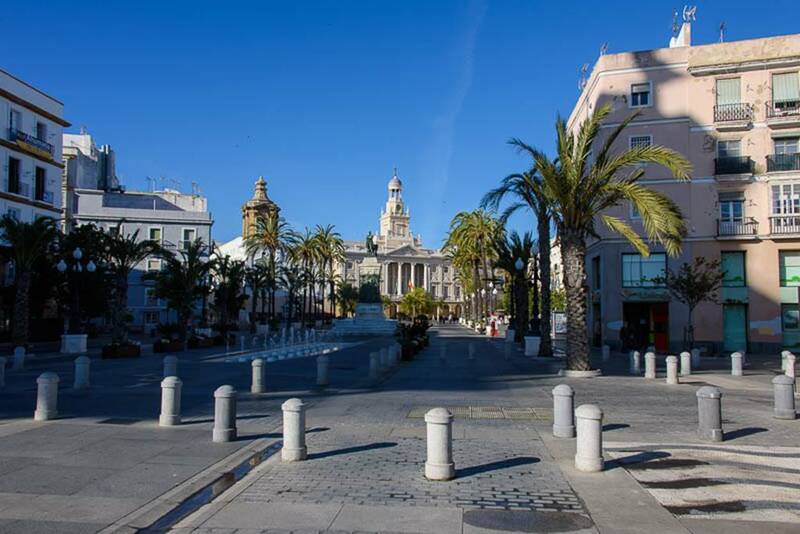 It is the capital of the province of Cádiz. 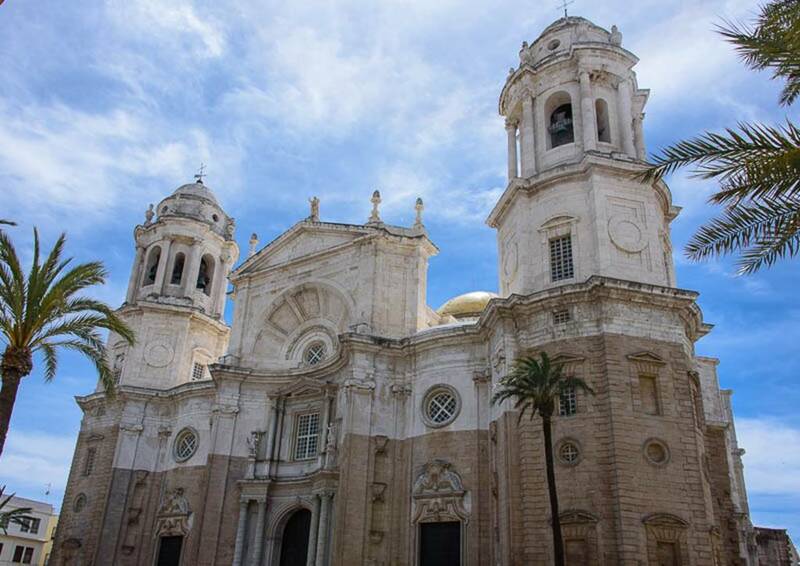 Cadiz is the oldest continuously inhabited city in Spain and one of the oldest in Western Europe and has been a principal home port of the Spanish Navy since the 18th century. 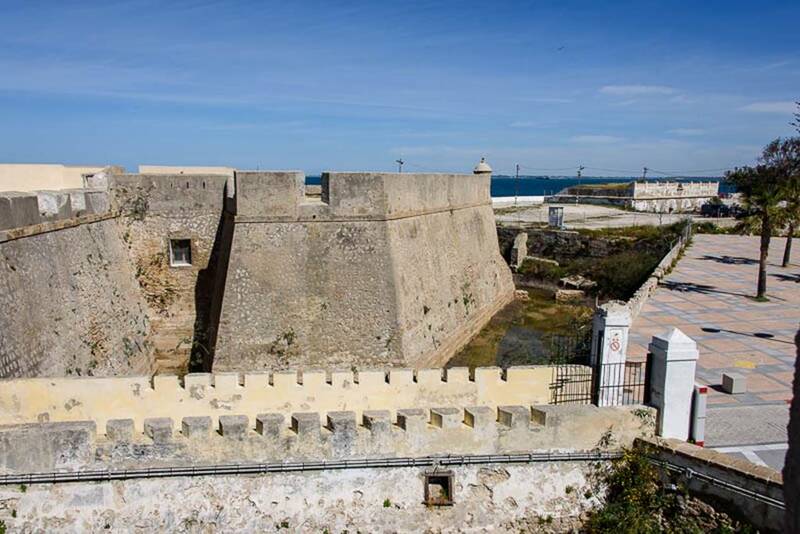 The older part of Cádiz within the remnants of the city walls is commonly referred to as the Old Town. 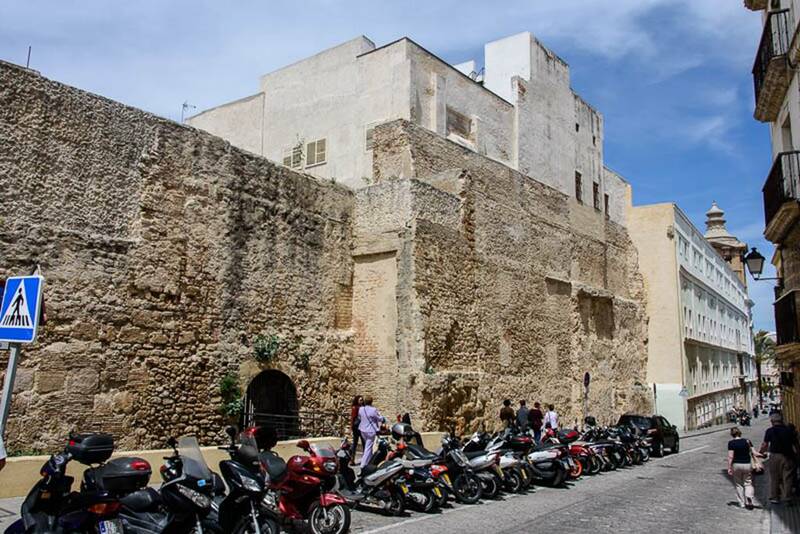 It is characterized by the antiquity of its various quarters, which present a marked contrast to the newer areas of town. 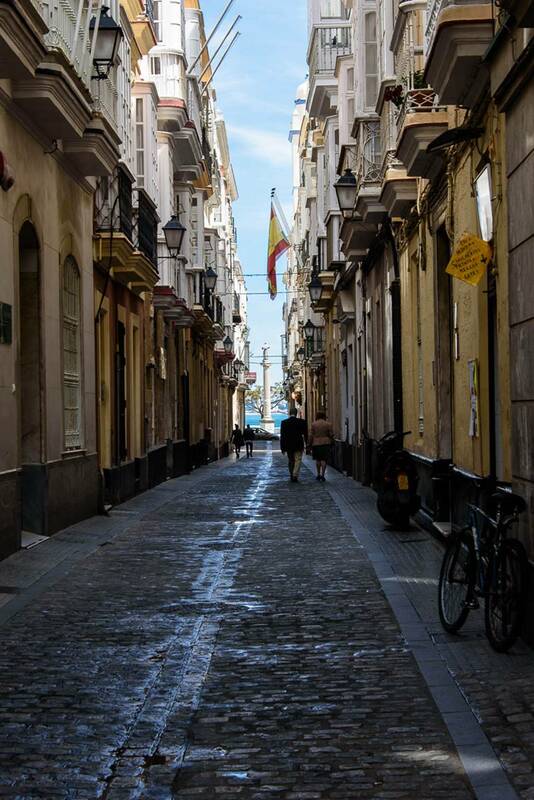 While the Old City’s street plan consists of narrow winding alleys connecting large plazas, newer areas of Cádiz typically have wide avenues and more modern buildings. 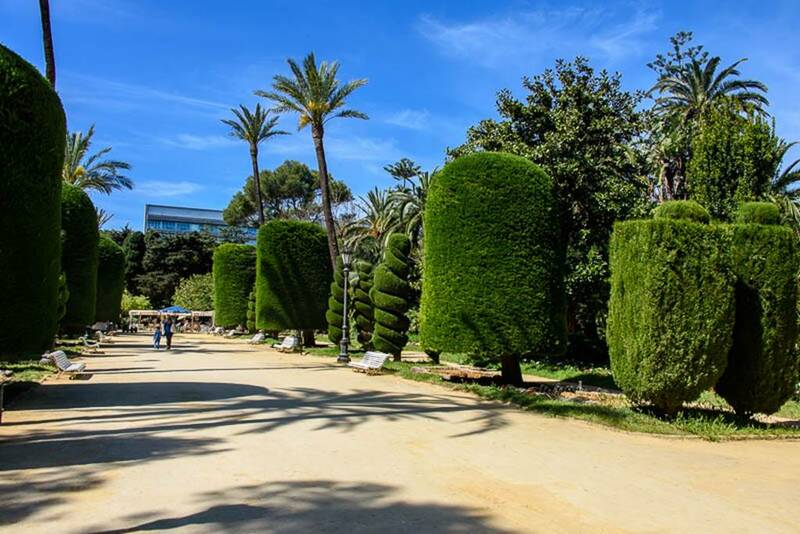 In addition, the city is dotted with numerous parks where exotic plants flourish, including giant trees supposedly brought to Spain by Columbus from the New World. 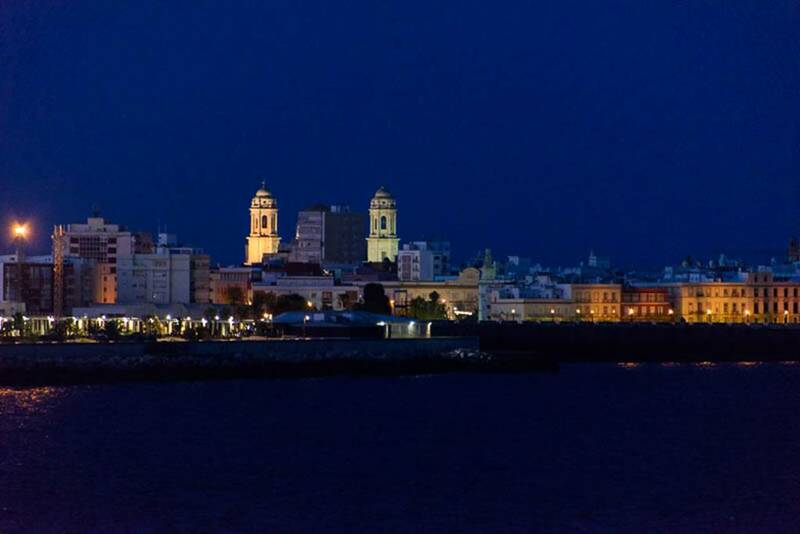 Pre-dawn Cadiz as we sailed into the bay. 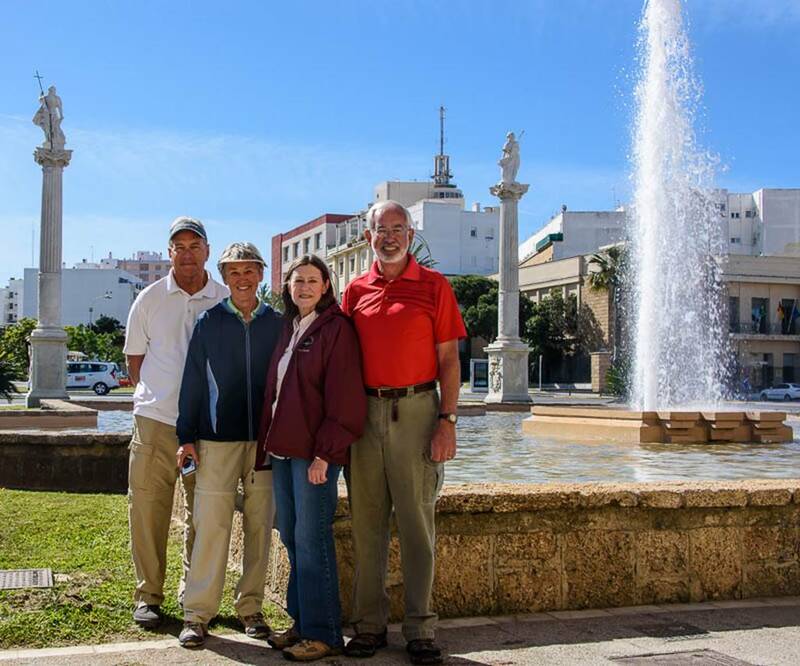 We scheduled an independent tour for Cadiz prior to sailing in January. We met our guide right on time and began the “panoramic” portion of the tour prior to a walking tour of the old city. 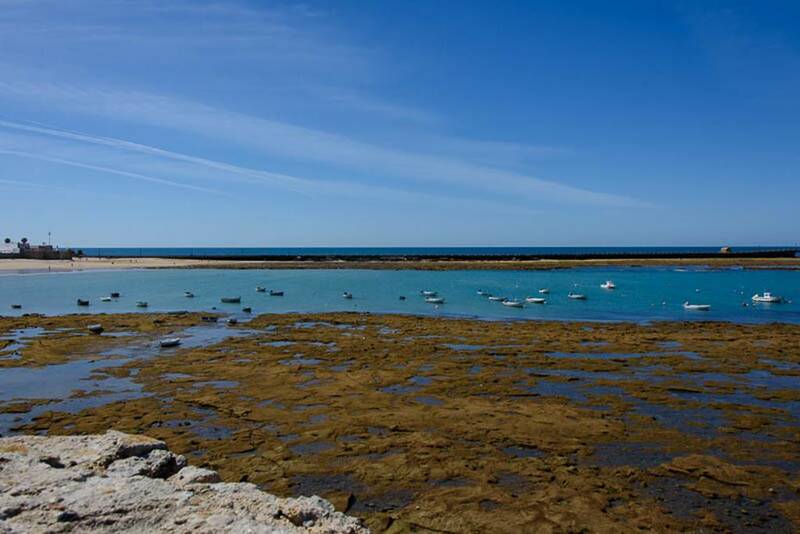 A beautiful morning in Cadiz! 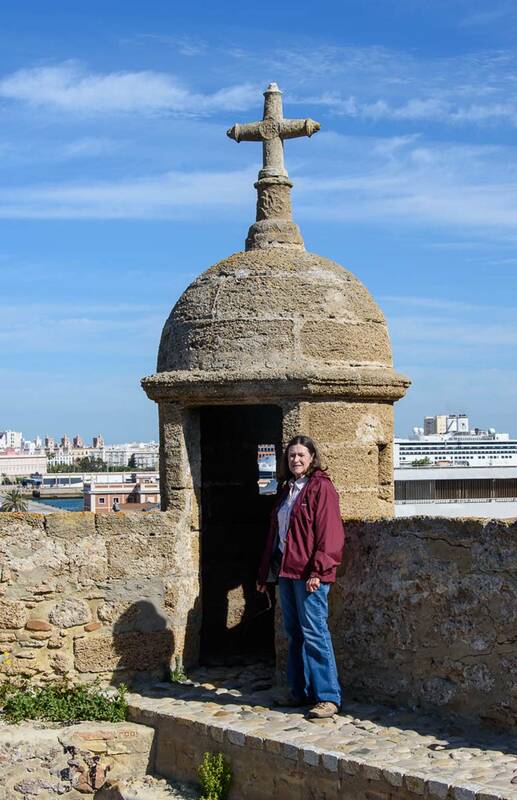 Our first stop was the fortified wall to the city. This wall has been built and rebuilt many times with modern lanes for roads cut through the wall. 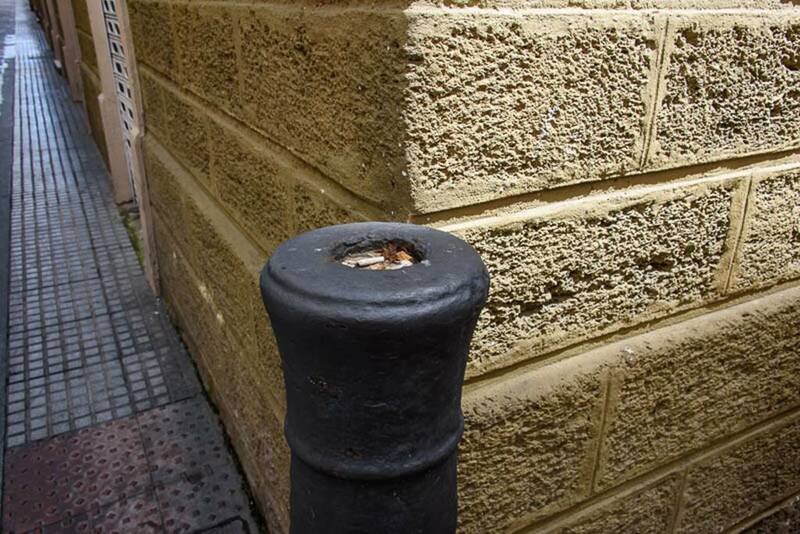 This wall withstood an assault by Napoleon for over a year. 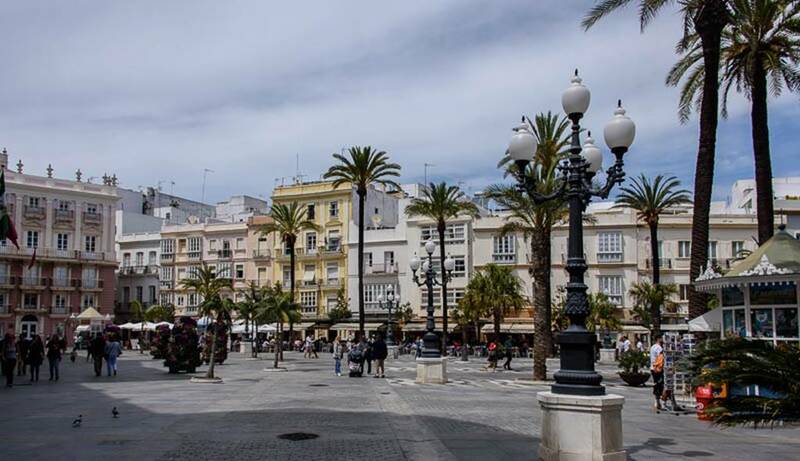 He was never able to take the city and for a while Cadiz was the capital of Spain since the majority of the country has succumbed to Napoleon. 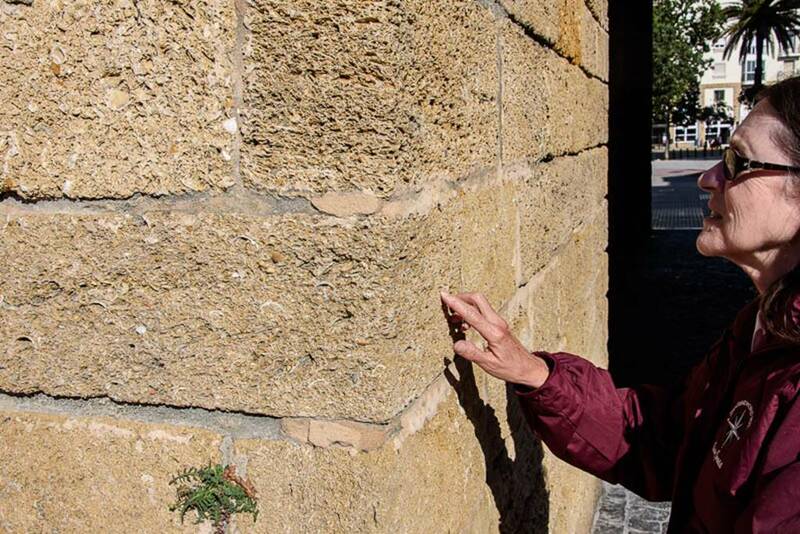 Kay, examining the “oyster stone” blocks from which the wall is made. We saw many old buildings constructed from this material. 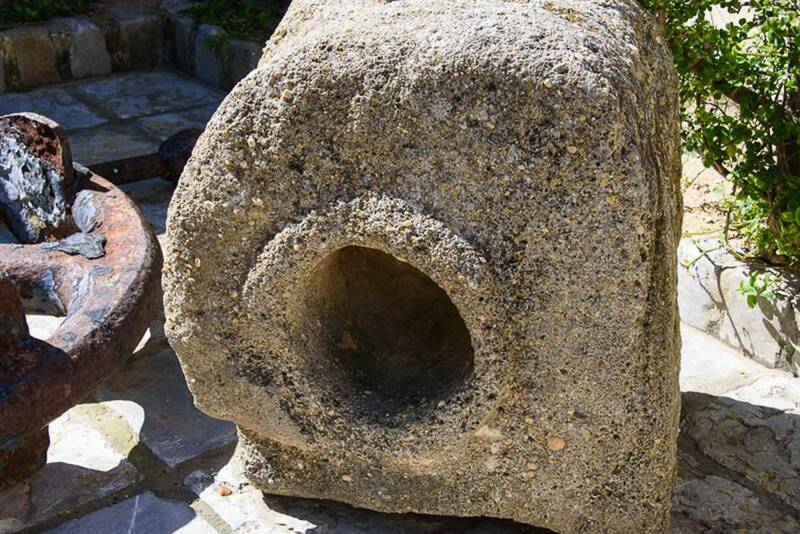 It is now unlawful to quarry the stone. 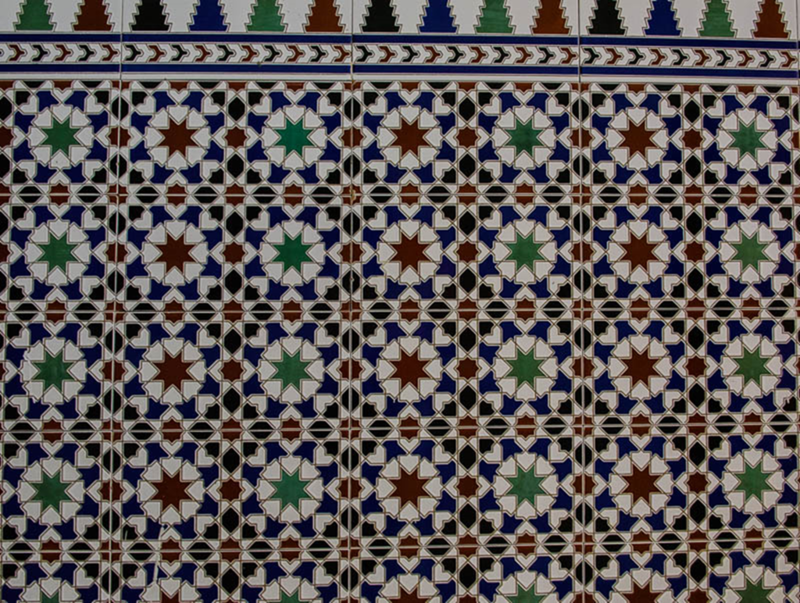 Taken just outside the wall near the modern fountain. A watchtower on top of the wall. 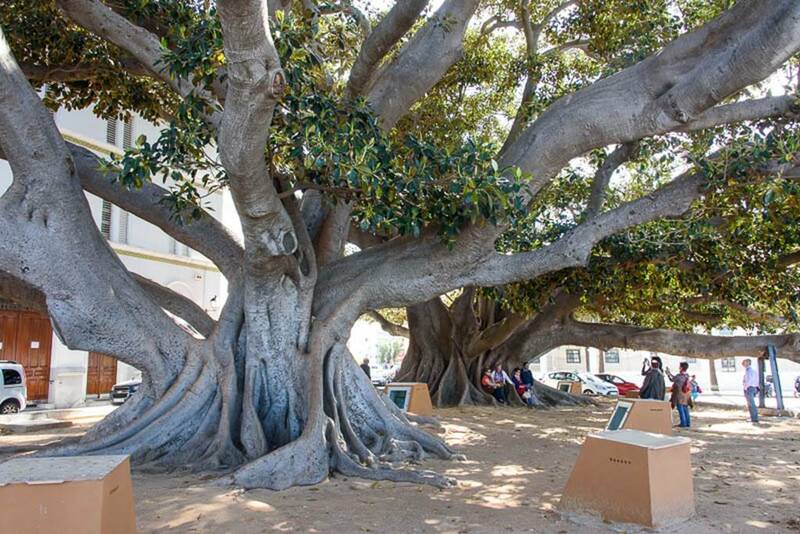 These are two of the trees which Christopher Columbus supposedly brought back from the “new world”. 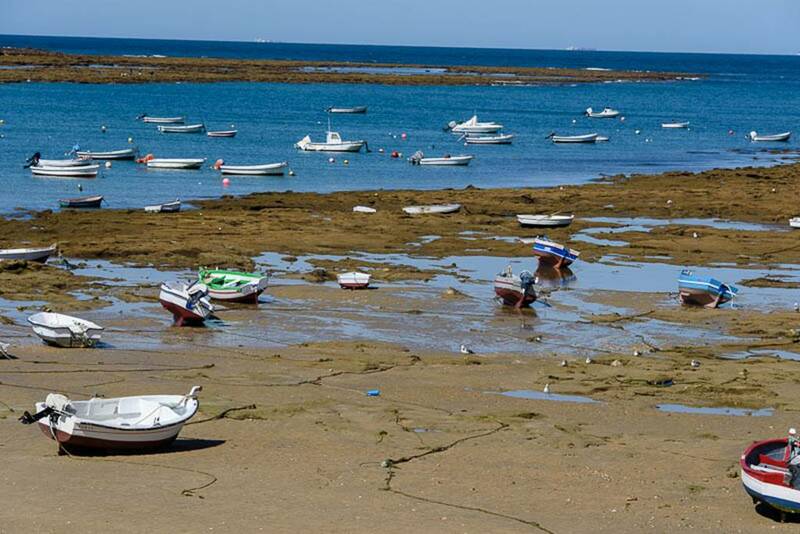 Low tide on Caleta Beach. 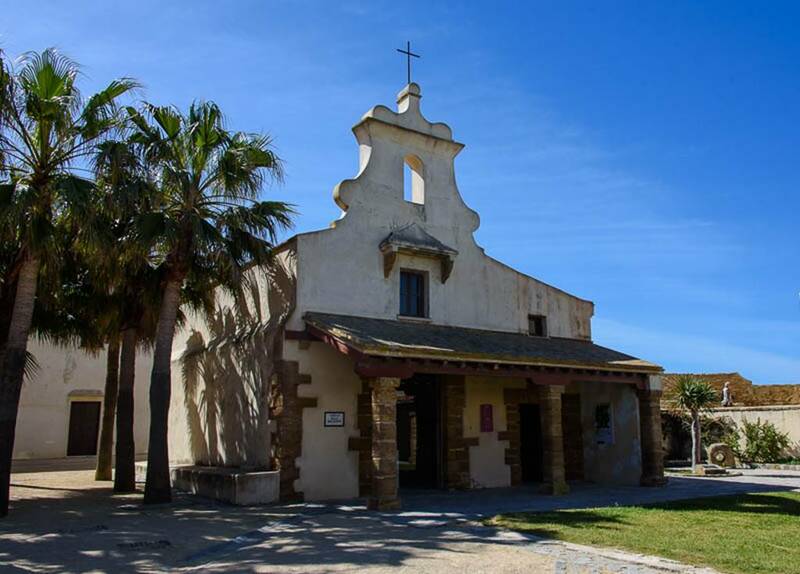 Santa Catalina Chapel. 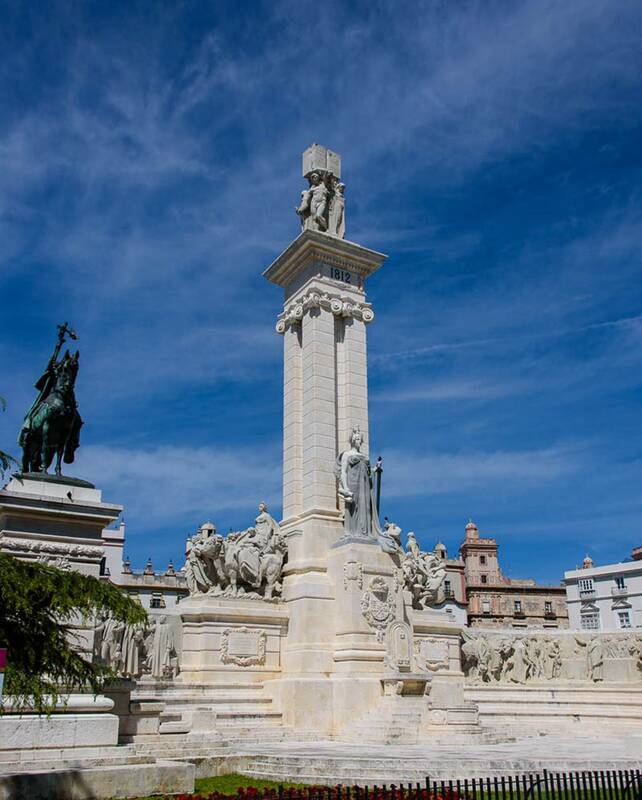 Dedicated in 1693 under the rein of Carlos II. Santa Catalina Castle. 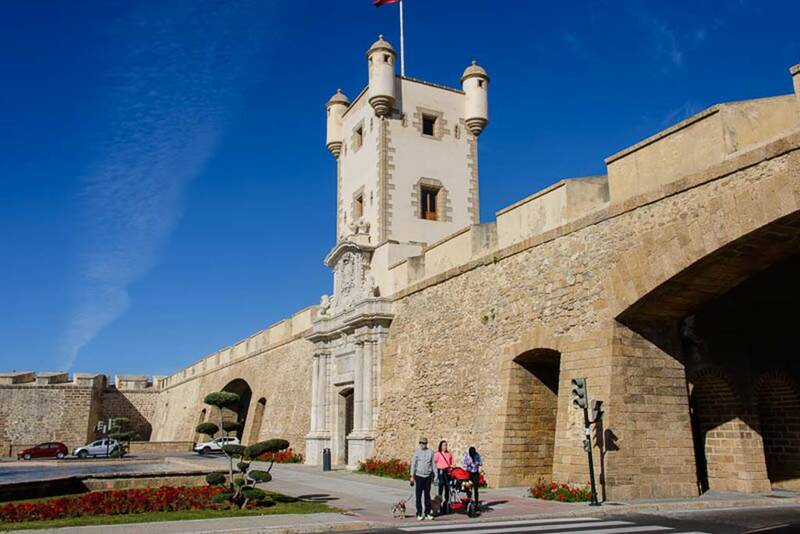 Ordered built by Felipe II after the Anglo-Dutch looting in 1596. The beautiful Parque Genoves. This large park contains hundreds of plant specimens from around the world. A section of ancient Roman aqueduct. On end has a protruding lip and the other has an equivalent indention to fit the pieces together. The Constitution Monument. 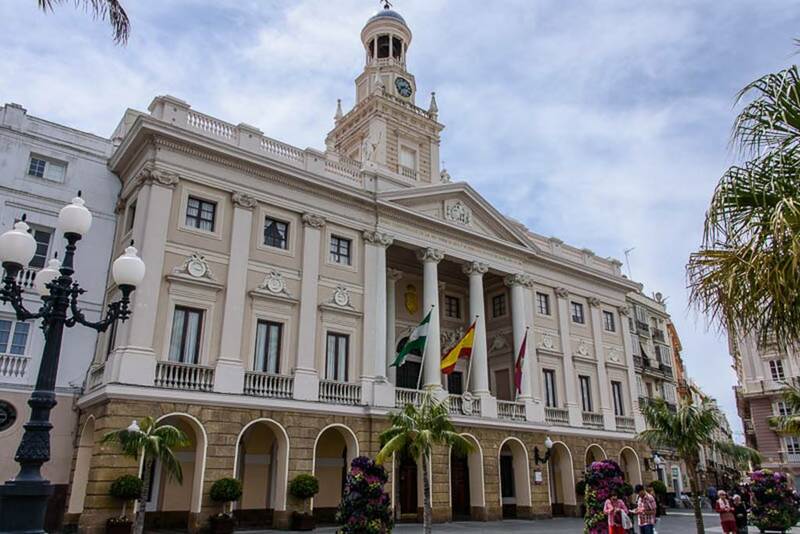 It was erected in 1912 to celebrate the Centenary of the Spanish Constitution. 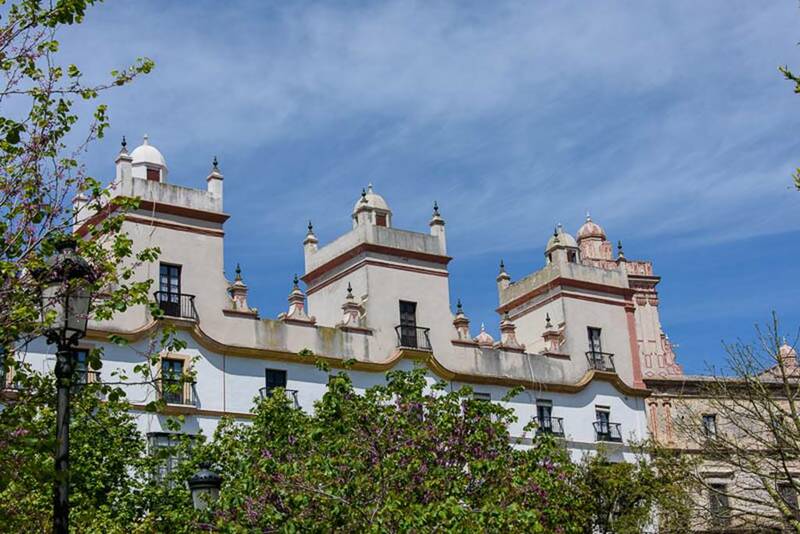 In many of the former wealthy merchant houses you could see these towers. They were a symbol of wealth. The higher the tower or the greater the number of towers, the wealthier you were. Our guide for the day, German Ruiz Lara. German was very pleasant, very knowledgeable, and spoke very good English. 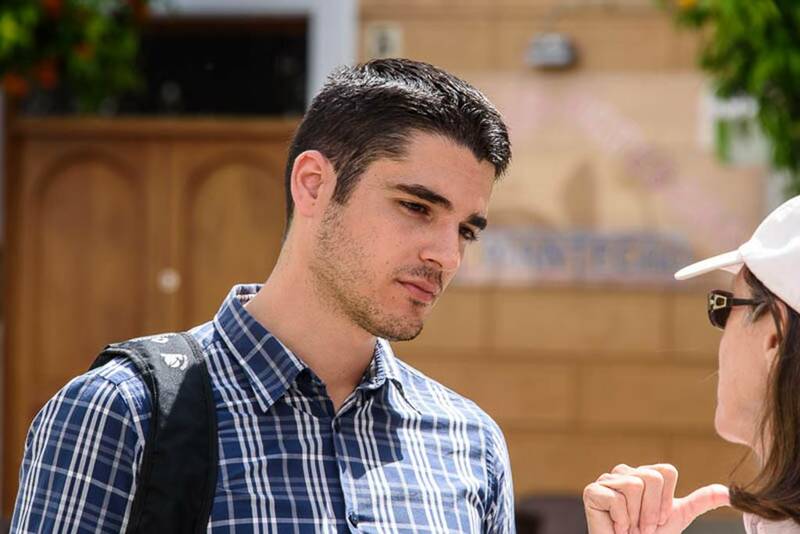 He has a degree in chemical engineering, but with a 40% unemployment rate in Spain, he is doing something he enjoys for the time being. German obviously has a strong work ethic and lamented about the general laziness of so many in the city of Cadiz. 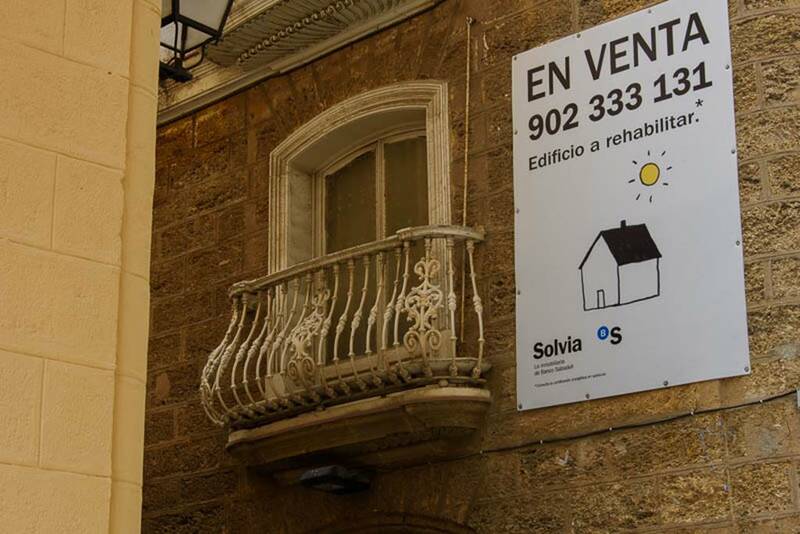 Unfortunately due to the fact that the city is a confined peninsula, there is no room for expansion, the cost of living is very high and most of the people who work here live outside the city as does German. 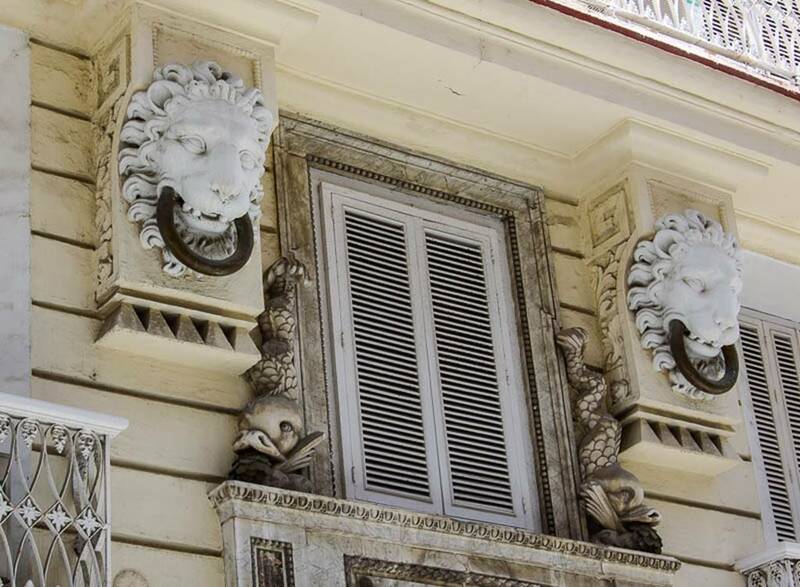 I have seen these type balconies in other old cities of Europe but did not realize the design had a specific purpose. This design accommodated the ladies wearing the large flared skirts of the time. 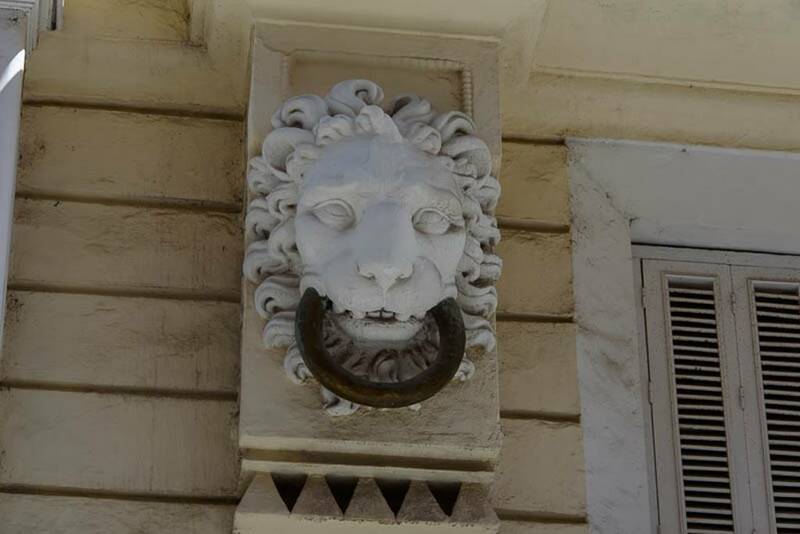 The Lion with a ring in its mouth signified the house of a slave trader. The fish with coins pouring from their mouth on either side of the window indicated that this slave trader was also rich. 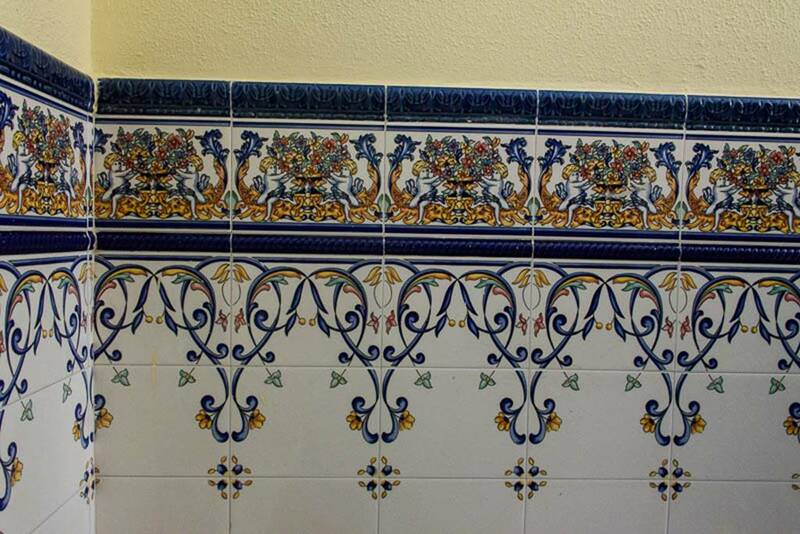 By stepping inside the “outside foyer” leading to the courtyard of the wealthier homes, you could see beautiful tile entryways. 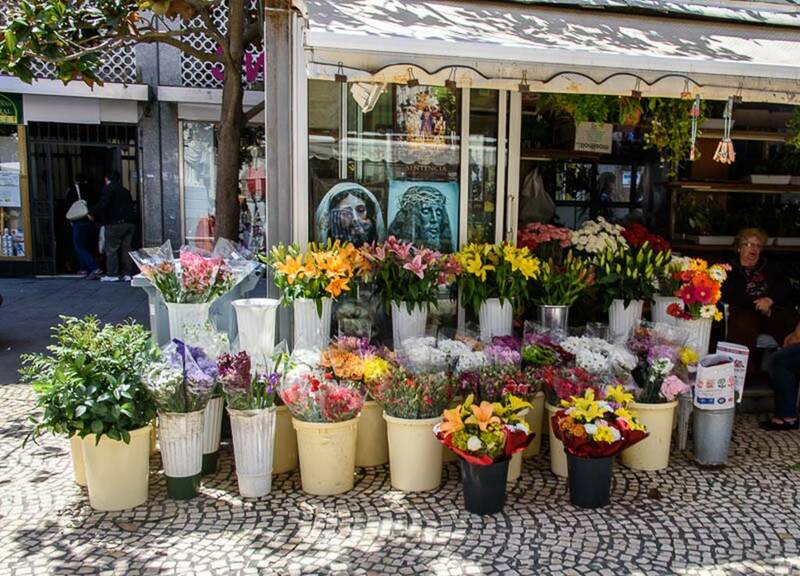 Here many flower venders could be found. 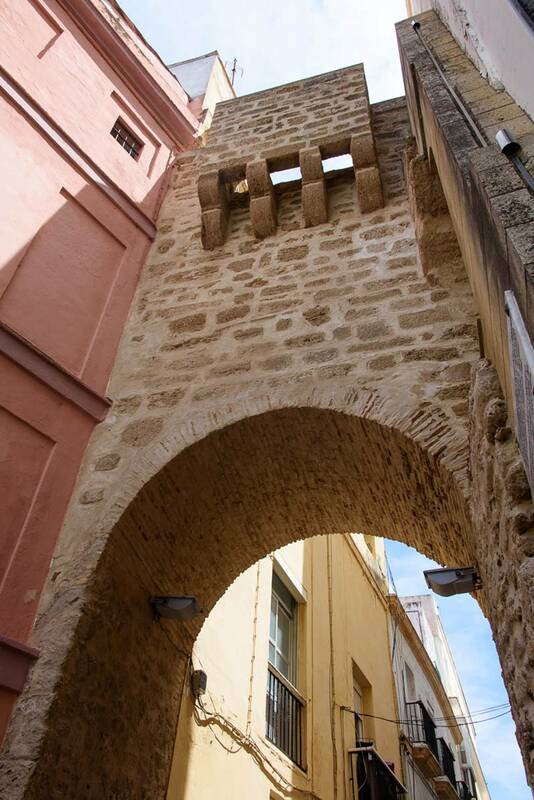 This gate dates from the 13th to 15th century. 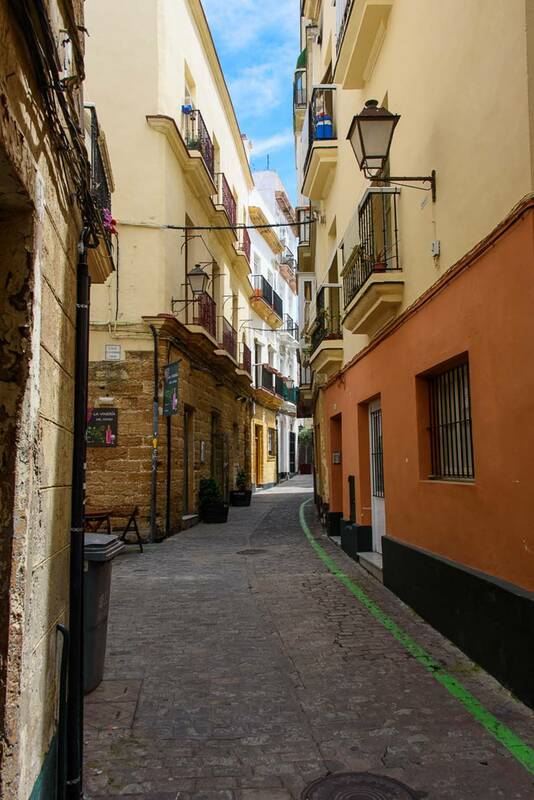 I love the curved streets and alleys of the old cities. A part of the ancient Roman wall. 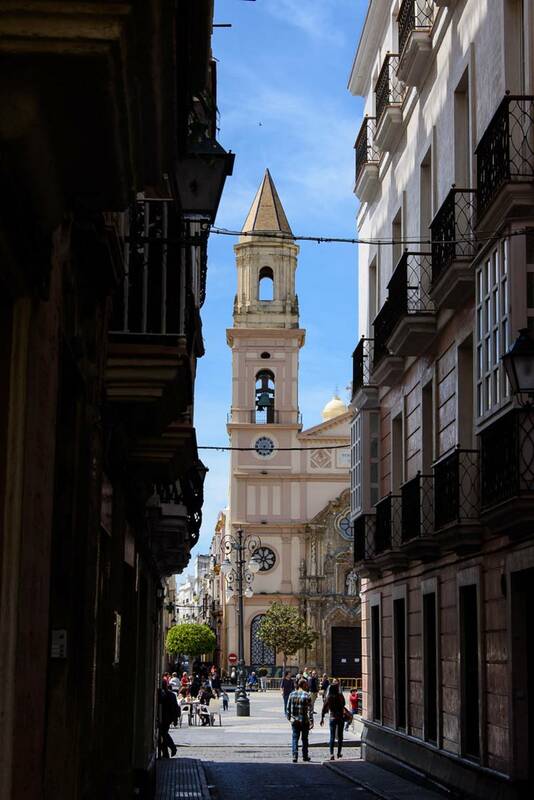 One of the dozens of beautiful squares in Cadiz. 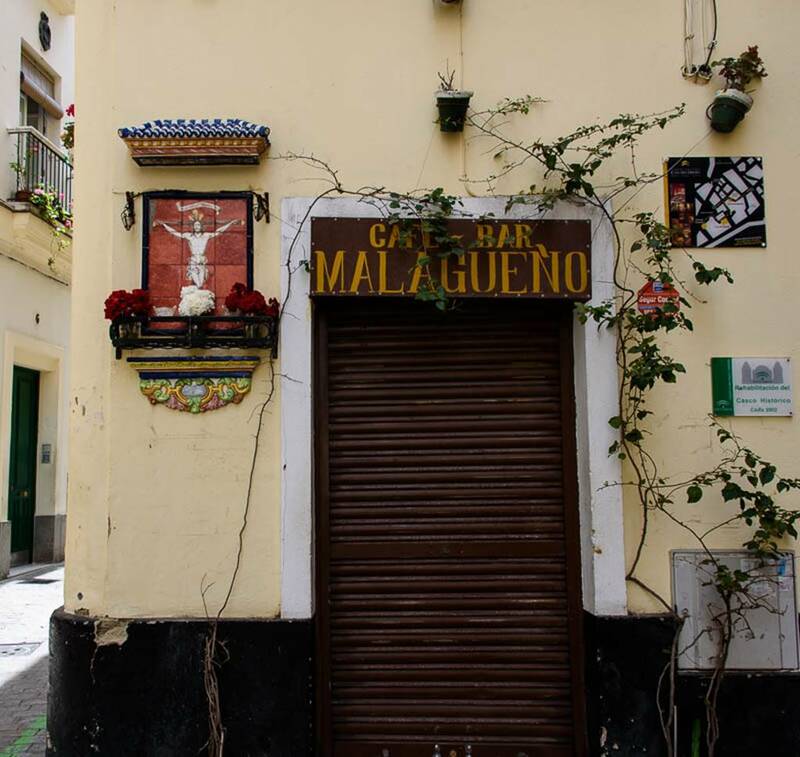 The city of Cadiz was a surprising stop. The city is beautiful and is full of history. It is somewhere I would definitely return to if the opportunity arose. Our guide, German, also helped to bring the history alive with his knowledge and ability to relate in vivid details the city’s history. Monday and Tuesday, days 105 & 106 are sea days. We learned that our itinerary has changed. We were scheduled to be in Ponta Delgada, Azores, Portugal on Wednesday and then on the island of Horta on Thursday, about 175 miles away. Due to the low pressure area passing through the port in Horta is expecting waves of 12 to 16 feet with winds up to 40 mph. 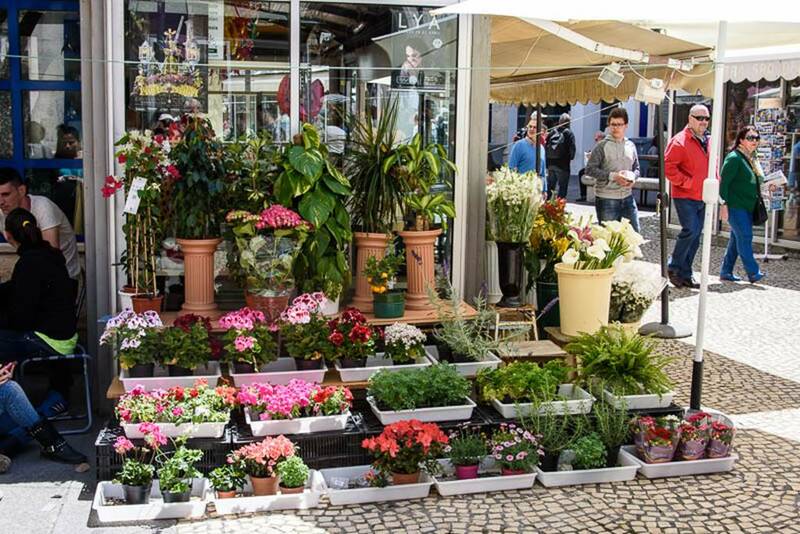 Since this is a tender port the captain made the decision to spend the night in Ponta Delgada and skip Horta entirely.